By sheer coincidence that they were listed back to back in the short story collection I was reading yesterday, today’s authors are both Australian. I occasionally bump into online articles or a review focusing on Australian genre authors. Apparently it’s a niche in genre publishing, a specific look at the writers from down under. It’s nice to see praise thrown as a group of writers like that. It helps with your perspective. Not all English language writers are from the US or the UK. 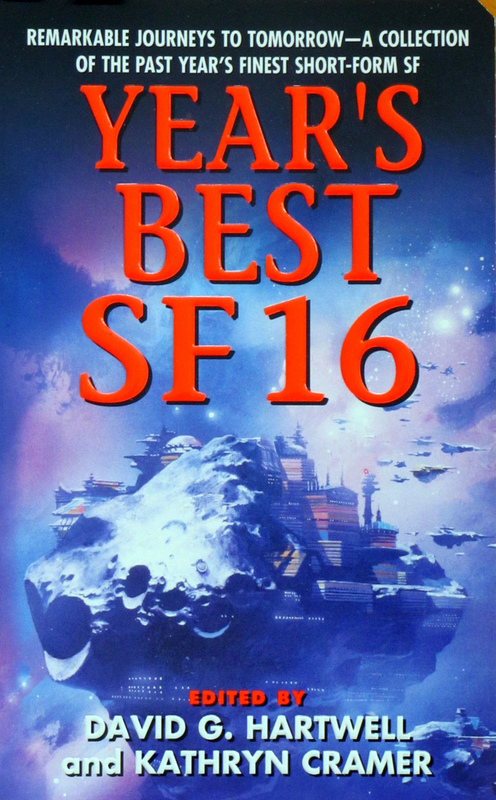 Overall, the Year’s Best SF 16 has been pretty good for its diversity in writers. On to the reviews! Broderick has been writing science fiction stories since the 1960s but this is the first time I read one. It’s not a simple read, there is a lot of information thrown at the reader and you have to be active in putting things together in order to properly understand the story. I’m not sure I understood it completely, to be honest. Who can blame me when the story uses advanced mathematics and geomorphology to try and solve the mystery of the Moon’s disappearance? The characters, all four of them, are straddling the line between insanity and genius. One of them happens to be an intelligent talking dog (he was surgically altered). The plot, as best as I could tell, is about a small group of characters living on an abandoned Earth. Someone or something has moved most of the population to Venus, after terraforming it to allow for its colonisation. A man, Blackett, was on Venus for a short time but inexplicably ended up back on Earth. He’s either trying to figure out how to get back to Venus or solving the mystery of the disappearance of two moons (Earth’s and one of Jupiter’s). He’s quite depressed and talking with his potentially insane psychiatrist probably isn’t helping much. His mystery solving skills involve a lot of reading and plenty of complex conversations with one of his neighbours and his psychiatrist. Oh, and the talking dog I mentioned before also talks about really complex things. The story ends with Blackett succeeding in one of his goals or going completely mad. It would take a smarter or more attentive reader than me to figure it out, I think. The story has a neat idea at its core. Broderick is working in the vein of J. G. Ballard (according to the editors’ introduction and, based on the little that I know of Ballard, that is accurate). The subject matter is complicated and Broderick’s writing style doesn’t help as it’s very dry and lacks any real emotion. It’s almost as though this story is trying to prove what the term speculative fiction really means as the science is heavy, and readers are forced to follow along closely in order to understand what is really happening in this story. I really don’t think I’m the intended audience with this one. It’s certainly not bad. Broderick clearly has skill as a writer and enjoys playing with big ideas, but the lack of emotion or any narrative momentum made it difficult for me to enjoy “Under the Moons of Venus”. Originally published in a collection of short stories by Australian writers, Car Sparks’s “All the Love in the World” is a post-apocalyptic story. The plot doesn’t concern itself with the cause of the apocalypse or even the details of civilization’s collapse afterword. It’s a character-centric story. A woman (I don’t think we ever get her name) tells her story of living in a barricaded little neighbourhood. People live a crowded lifestyle because of their fear of the outside. There haven’t been any shootings or large scale violence in many months, but the fear remains and it seems like a good idea to stay behind the barricade and try to develop a self-sustaining community. The problem with that kind of lifestyle is that even small changes can cause devastating, even life changing or deadly, consequences to the community. Jeannie’s arrival did that for our main character. It didn’t take long for Jon, the main character’s partner, to move on and replace her with Jeannie. The main character’s life, the life she created for herself post-apocalypse, slips away simply because of the presence of a new person in her little community. When Jon and a couple other people fall ill with typhoid, the woman sets out into the city to try and trade for some medicine. On the other side of the barricades she encounters many different kinds of people and ways of living. It’s essentially a new world. She comes to the realization that living behind barricades might not be for her. The world has ended, but life hasn’t. Sparks uses the post-apocalypse setting to tell a life-affirming tale. The woman’s pettiness early in the story leads to a well realized change of character by the end. The idea that a large scale, worldwide catastrophe wouldn’t put an end to life is explored. Living in this story means specifically doing things that would seem pointless in a world focused on surviving. Things such as serving pancakes for free at the community market, surfing, or playing guitar and singing songs by The Beatles. This story won’t change how you feel about post-apocalypse stories but it might delight in its unusually positive take on the end of the world. Next Sunday: I enjoyed my break from Robert E. Howard’s Conan and I think I’ll continue with some more science fiction stories.